Hailed as the greatest sorcerer from Vinheim Dragon School, "Big Hat" Logan left the Dragon School to Lordran in search for the legendary Regal Archives, which houses the knowledge of the Father of Sorceries. In a hidden area behind a sleeping Serpent Soldier. You need to adjust the boulder dispatch machine so that it will smash a wall with a guard leaning against it. Alternatively, that Serpent Soldier can break the wall with some of his attacks (the forward sword stab or the second hit of the normal sword sweep, for example). You can either roll through them or block them by standing next to the wall. Using a Zweihander or other Greatsword to break the wall will not work. He is locked inside one of the hanging cages, to open it you need the Cage Key, which is found near the Crestfallen Merchant in the tower across the broken bridge before the Iron Golem. Or, you can also unlock his cell with Master Key. Once freed, he will move to the Firelink Shrine. He will still be located here even after killing the Iron Golem. He will sell you some of his spells once he arrives here, but only if your Intelligence is at least 15, though this limitation will be dropped if you meet him later. Talk to him and he'll speak about continuing his travels. He'll leave some time after acquiring the Lordvessel. Once you put the Lordvessel on Firelink Altar, he'll leave the shrine (he'll stick around until you get captured by Seath the Scaleless within the archives). Once again he is trapped behind bars in the lower level of the prison area you reach after your first encounter with Seath the Scaleless, guarded by several Pisacas. You'll need to get the Archive Tower Giant Cell Key to unlock the cell, it's located behind the removable bookshelves leading to the crystal caves, right after the second bonfire. It's in the treasure chest closest to the lever that opens the descending staircase. Get back, unlock his cell and talk to him. He'll move to the book room. In a small room with the chest containing a Blue Titanite Chunk. The room entrance is near the tall ladder and the shortcut lever. You do not need to meet the Intelligence requirement to purchase his spells at this location. After you have defeated Seath the Scaleless and have bought all his spells, talk to him several times, and you'll notice that he's clearly gone mad. This triggers his next location, once you go through a loading screen (by quitting and reloading, using a Homeward Bone or using the Homeward miracle). You'll find him standing around in the room half-naked, still wearing his hat. Defeat him and he'll drop the Big Hat, his Tin Crystallization Catalyst, and the White Dragon Breath spell. Also go back to the area where he was before, where he sells his spells, as there is a new chest containing the rest of his armor set, the Big Hat's set, and Logan's Catalyst. You may have to go through a loading screen for the chest to appear. Note that he only drop these items if you kill him after a certain point in the game. Killing him immediately in Sen's Fortress or Firelink Shrine will result in no drops. If you have already beaten Seath the Scaleless and haven't done anything with Big Hat Logan yet and you want to complete his quest, do the steps above, but skip the prison tower cage part in The Duke's Archives. 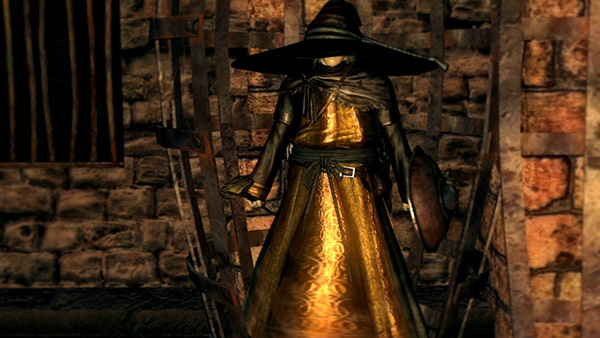 Note that you may still need to visit the prison tower cage, even though Logan is not there, to trigger him to move from Firelink to The Duke's Archives. Killing Seath the Scaleless before unlocking Logan's cell causes him to teleport to his final location. 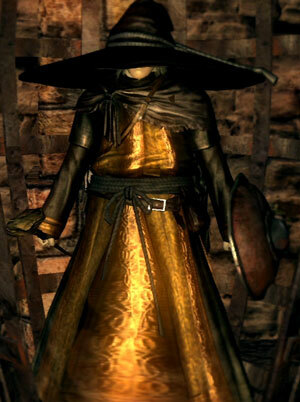 If you kill him anytime before he goes crazy and attacks you in Seath's room, the chest containing the Big Hat's Set and the Logan's Catalyst will not appear. To get the trophy/achievement "Wisdom of a Sage", you must follow the complete storyline in order to get all Sorceries. Mm, you seem quite lucid! A rare thing in these times. I am Logan. I'm a bit cooped up, as you can see. I have a bright idea. Suppose you set me free? i'm old and empty-handed, but i could repay you with my knowledge, and sorcery. Oh, heavens, thank you. I'm saved. but I must log a few things, and I owe you a favour. I will return to Firelink Shrine. Speak with me there, so that I may impart my sorcery. Oh, hello. Don't mind me. Go on ahead. I'll be along later. phoo-hah-hah, I'll be just fine, young one. There you are. I was expecting you. As promised I will share my sorceries. Hello there. I was expecting you. As promised, I will share my sorceries. I am afraid that you are unable to learn sorcery. The basic framework, you see. It cannot be taught. Oh, do not fret. Life isn't all about sorcery. You will find your own way. Don't frown with regret; peer forward with your head held high. Hello there. Glad to see you alive. It seems you've come quite a way. Excellent. You are certainly ready. I shall teach you sorceries. I, too, will leave soon. Undead or no, I shan't stay here forever. You have great potential. Don't go and die over nothing. I quite understand. Study is invigorating! Very well indeed. I'm pleased to share my sorceries. Hello there. What have you been up to? I thought that perhaps you'd gone Hollow on me. So have you come to further your study of sorcery? perhaps some sorcery will change your mind! Heavens… the folly of youth. Hello again! What a chance meeting this is! Alas I'm imprisoned once again. I don't suppose you could stage me a getaway? The Archives , such a storehouse of knowledge. So close, but just out of reach! The thought offends me so, I could simply die! As a student of the arts, you understand me, yes? Oh, than you very much. I'm saved. That makes twice. I must be sure to repay you. I will visit the archives. If I discover any new spells, I shall share them with you. Prepare to be impressed, by the onward march of sorcery! Hello. Don't mind me. Go on ahead. I'll head out soon. I wish to lay down my plans before I visit the Archives. This place is truly magnificent, more than expected, even. As promised, I shall share the new sorceries with you. And the secret of Seath's immortality. Ah, the secret of Seath's immortality? If you have fought him, and were imprisoned, you must know that Seath is a true Undead, different from ourselves. His wounds close promptly and no mortal blow affects him, granting true insulation from death. It is an effect of the Primordial Crystal, a sacred treasure pillaged by Seath when he turned upon the ancient dragons. So, only by destroying the Primordial Crystal can you so much as scratch his hide. And it so happens, the primordial Crystal is in the inner garden of these very archives, the Crystal Forest. The tomes stored in these archives are truly magnificent! A great pool of knowledge, the fruits of superior wisdom and an unquenchable desire for truth. Some would say Seath had an unsound fixation …But his work is a beautiful, invaluable resource. And I certainly hear no antipathy for that wonderful scaleless beast. The knowledge here is limitless. I will absorb it, then share it with you. Hello there. you really are very diligent. Oh, I understand we are in the midst of a revolution! Come again, any time you please. For I too, learn, whilst teaching a student. Oh hello there. Where have you been? time is a resource. Let's delve in promptly. Oh, there you are, it has been a while. Or were you just here? …How dare you disturb me!